I hope you all found some time to relax and also some sunshine during the holiday period and are now ready for the start of the new school and Scouting new year!. In addition to the weekly meetings, this is always a busy term for our youth members, parents and supporters and the reverse side of this edition provides the information on these events and activities. Please see over. During the summer months, Eagle and Scorpion Troops held summer camps in East Sussex and our Explorers have been busy raising funds for their expedition to Switzerland in 2013 with Bag Packing at Tesco's. 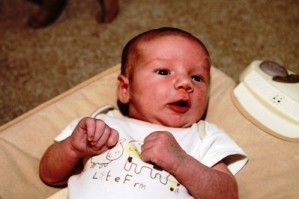 Congratulations to James and Claire Perfett on the birth of their Son, Jack Robert Archer on Monday 6th August 2012. Mum and Baby doing great and Dad still somewhere on cloud 9!!! For those paying termly your subs will be due at the start of next term. Please put a cheque or cash for £30 into a named envelope and hand it in to your leader. Congratulations to Ed Harrison and Claire Patterson who were married at the Church of the Resurrection in Drayton. The Wedding was attended by many of their friends and family including some of the Explorer Scouts who were in the Unit the same time as Ed and also members of Staff from the Park Community School where both Claire and Ed are teachers. The Bride of course was radiant and despite the strong rumours, Ed did not turn up in Scout Uniform and riding a Trek Cart!! 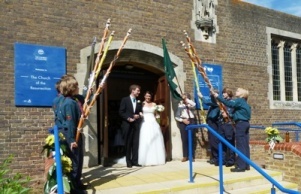 The photograph shows some of Ed's Scouts from Eagle Troop who formed a guard of honour for the happy couple on leaving the Church. It is with much sadness that we say goodbye to Lorna, Euan, Cameron and especially Jim Simpson who will be moving from the Island in early September. Jim has been the Leader of Lion Troop for 11 years and Lorna helped occasionally with Aspen Beavers and also managed our 100 Club for many years. Thank you for your support to the young people of Hayling over many years and we wish you every success for the future. www.haylingscouts.org.uk. If you look above the "Latest News" and select the event, you will find details and booking arrangements. Booking: Online or by form. You may have booked for the original event, but please book again. No uniform required, but packed lunch, drinks bottle, sun cream and hat essential. All Beavers and Cubs are invited to join the congregation of St Andrew's Church. A donation of tinned or dried food is welcome as it will be used for the food bank that all churches on Hayling contribute to, to help people here on the Island. There will also be a collection. Parents and families are welcome to stay. Why not come along with a team of 8 to challenge for the Dreadnought Trophy in this our 18th annual quiz night. Always a great evening. Jamboree On The Air and Jamboree On The Internet provides an opportunity to communicate with Scouts throughout the world either over the Air waves or the Internet. Everyone is welcome to come along and join in this great event, for as long as they wish. There are plenty of other activities on offer. Beavers and Cubs must be accompanied by an adult. This annual event is open to members and the families of Hayling Scouts and Hayling Guides. No need to book - just turn up on the night. Hot Dogs, Burgers, hot / cold drinks and a tuck shop will be available for purchase. Cost 20p entry for adults, children free. We will have about 8000 books on offer covering many authors and topics. We will be running our Xmas Card delivery service again this year, More details in early November.